Mother’s Day is an extraordinary day where everyone has an opportunity to celebrate their mother and some people have the special privilege to celebrate being a mother as well. It is also a divine opportunity to connect with the Universal Mother, the mother of everything from the sun, the moon and the stars right down to us, and tell her you’re thinking of her too. 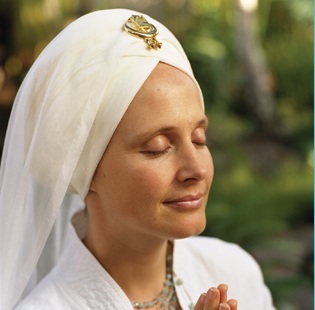 1) Mother’s Blessing by Snatam Kaur – A new classic for Mother’s Day. Snatam’s beautiful vocals in Spanish, English and Gurmukhi carry the essence of a powerful prayer from a mother’s heart. 2) Ma by Guruganesha Singh and Snatam Kaur – Connect with the Divine Mother as you call her name and invoke her blessing. 3) Adi Shakti by Gurudass Kaur and Gurudass Singh – Honor the Adi Shakti power in every woman. 4) Lakh Khushiaa by Snatam Kaur and Prabhu Nam Kaur – Feel the sacredness of a mother and daughter’s love for each other as they sing a beautiful duet. 5) Sopurkh That Primal God by Nirinjan Kaur Khalsa – Join mothers everywhere in reciting this sweet prayer for their sons and beloveds. 6) Amrit Peevaho the Power of a Mother’s Prayer by Satkirin Kaur – Let a mother soothe you with a gentle shabad. 7) Adi Shakti Bhangra Remix by Sada Sat Kaur – Shake what your mama gave you while grooving to this great remix for the Divine Feminine. 8) Sarab Nirantar – Hari Bhajan Kaur and Sat Hari Singh – Keep your mother always in your heart listening to this beautiful version of a line from the Sopurkh. 9) Rakhe Rakanhar by Singh Kaur – Let the forces of angelic protection guide your life like the loving presence of the mother. 10) I Am Happy by Snatam Kaur – Teach your kids this beautiful mantra Yogi Bhajan told children to sing to their parents to lift their spirits.